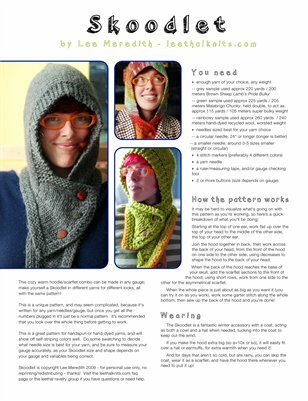 This is a knitting pattern for a buttoning cowl with a hood. This pattern is for any weight yarn! This any-gauge hoodie scarflet combo, with button closure that holds it on when the hood is down, can be made with any yarn/needle combo! Just plug your gauge into the formulas and you’re good to go. Make yourself a styling Skoodlet in different yarns for different looks, all with the same pattern! See the Skoodlet page on leethalknits.com or on ravelry.com for photos and more details about the pattern.